You’ll be welcome at our Midwest Daffodil Society Show in the Bernstein Room at the Chicago Botanic Garden on the above dates and you will be delighted by the venue, arguably one of the best for daff shows this side of the Atlantic, with an enormous walk-through crowd who will be at the Garden for some other attraction and will be delighted to see such beautiful flowers of ours on display. • We have our own challenge: for your best 1 or 3 of any John Reed/Oakwood blooms. * And, this is bittersweet. It may be the last large entry at the CBG by Nancy Pilipuf, who will be joining her husband in smaller surroundings next year. Nancy has been in the MDS since its founding and was for many years the perennial winner of the Silver Ribbon, of most of the ribbons and awards for miniatures, and often had the only submission of the larger collections. Nancy is an Instructor, has plied those skills for many in the Midwest, talks fondly of her trip to the UK with some of you old timers some years ago, and talks with familiarity about just about anything and anyone connected to this niche of gardening hobbies. We’ll miss her entries while continuing to enjoy her MDS membership and we know that she will remain otherwise active. We’re exploring just how to help her lift those hundreds of bulbs in Garden Prairie (what an apt address! ), where her prize winners all grew up and were tended in her outbuilding equipped by Fred with a walk-in cooler that he rescued from a retiring flower shop. She doesn’t know that I am posting this and may not make a formal announcement of her forced gardening retirement. Let’s keep this between us and let her bring it up. She doesn’t do email and still isn’t online from home, I think. But I couldn’t share the title announcement without acknowledging her importance to our little group. Details about our show are (finally) posted at our website, MidwestDaffodil.org, which had wandered out of control. The rules for Hort, Photography, and Artistic Design are posted singly with the usual schedule publication pared down a bit. I know of a few tweaks that are needed, but tell me if there are serious omissions, etc. More info? Call or write. 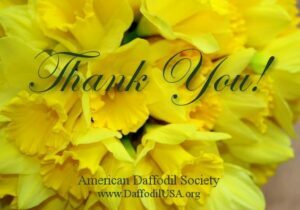 Thanks for the Midwest Daffodil news – and especially your news about Nancy Pilipuf. I will be there – just look out for shy bearded Australian.